Background: Maintenance of normal fluid homeostasis is challenging in neurosurgical patients. Consequently, we studied hydration assessment in neurosurgical intensive care patients. Methods: Pulmonary artery catheter thermodilution (PACTD) is the conventional method for measuring cardiac index (CI) and mean pulmonary artery occlusion (MPAOP) or wedge pressure (MPWP). We compared values from this technique with those derived from continuous cardiac dynamic monitoring (CCDM)-HeartSmart®, a new, less invasive, software-based technique. Over 4 years, we undertook an audit of 101 paired sets of data from 21 patients with sub-arachnoid hemorrhage who had pulmonary artery flotation catheters inserted as part of their treatment. Measured values of CI and MPWP were obtained retrospectively from patients’ charts and compared with values calculated using CCDM-HeartSmart® software. Results: Using the Bland-Altman method for comparing two measurement techniques, there was good agreement between measured and calculated MPWP (mean of differences –1.81, SD 3.97, SE 0.39, 95% CI –2.59 to 2.04 l/min/m2; two-sided p < 0.0001). The measured and calculated values of CI were also in good agreement (mean of differences 0.36, SD 1.30, SE 0.13, 95% CI 0.109 - 0.619; two-sided p = 0.0055, 95% limits of agreement –2.1 to 2.91 l/min/m2). This indicates that, when estimating CI and MPWP in critically ill neurosurgical patients, CCDM-HeartSmart® provides values close to those generated using PACTD. Conclusions: The CCDM-HeartSmart® could prove invaluable for optimizing response to fluid replacement and for guiding cardiovascular support in neurosurgical patients. This new, simple technology may help to facilitate routine adoption of perioperative optimization of blood flow using early goal-directed therapy. Treating neurological patients is a challenge, especially as many secondary pathological complications soon set in, necessitating extensive observations and treatment. Fluid resuscitation with early goal-directed therapy and monitoring of blood lactate and glucose levels is one of the many treatments necessary. This treatment requires the use of hemodynamic monitoring and maintenance of normal fluid homeostasis, which is beneficial for improving the chances of survival and averting permanent disability when treating any of the many complications that can arise after the initial insult. However, maintenance of normal fluid homeostasis can be difficult in these patients. Fluid, electrolyte and metabolic abnormalities can be complicated by cerebral edema resulting from a disrupted blood-brain barrier, and there exists a potential risk of neurogenic pulmonary edema with raised intracranial pressure. Conversely, acutely dehydrated patients may require rapid fluid resuscitation [1,2]. Various methods are available to identify hydration status, including simple clinical methods (e.g. assessment of tissue turgor, mucous membranes, capillary refill, and mean central venous pressure [CVP]) and more complex techniques such as thermodilution methods, esophageal Doppler monitoring, and pulse waveform analysis combined with lithium dilution measurement of cardiac output. As a result of difficulties in applying available technologies (e.g. problems relating to the insertion of highly invasive or intrusive consumables [catheters or probes], and the challenges presented by non-portability across each system and when transferring patients between wards and hospitals), optimal fluid management is not always achieved. In addition, most current technologies have limited utility because of their substantial cost, long learning curves, and need for operator input. All present methods for hydration assessment therefore have the potential for inaccurate estimation if not undertaken carefully, and the requirement for additional operator effort (as shown in 19.04% of the cases from the present study) restricts their use in the operating theatre, on the intensive care unit (ICU), and on general wards. We have investigated new bedside monitoring software known as continuous cardiac dynamic monitoring (CCDM)-HeartSmart® (HeartSmart Limited, Harlow, Essex, UK), which helps the clinician to assess hydration by calculating cardiac output (CO) and left-heart response to fluids and inotropes. The CCDM-HeartSmart® software contains new empirical physiological formulae that allow estimation of a patient’s cardiac index (CI) and mean pulmonary wedge pressure (MPWP) using mean CVP, heart rate (HR), mean arterial pressure (MAP), body surface area (BSA), height (cm), weight (kg), and temperature (T˚C). CCDM-HeartSmart® can be used in patients aged ≥8 years. The main advantages of CCDMHeartSmart® are its simplicity, portability, accuracy, and robust, non-invasive nature: no additional or specialized line insertion is needed. This study aimed to compare the values of CI and MPWP calculated using CCDM-HeartSmart® with those obtained from measurements made by the conventional method (pulmonary artery catheter thermodilution [PAC TD]) in patients with sub-arachnoid hemorrhage (SAH). We then examined four cases which contained at least one paired set of spurious results. This is a common feature when the PACTD method is used by operators who are not sufficiently knowledgeable or skilled in performing and/or recording the hemodynamic variables, resulting in questionable results and controversy regarding the value of PACTD hemodynamic monitoring and early goal-directed therapy, which is not as yet used routinely in clinical practice. CCDM-HeartSmart® is a continuous cardiac dynamic monitoring software system that is CE marked under Appendix 7 Class 1a and registered with the Medicines and Healthcare products Regulatory Agency (MRHA). Patents have been applied for and granted in many countries. This audit complies with the Helsinki Declaration. CCDM-HeartSmart® uses a software program that incorporates a series of physiological formulae to determine CI in l/min/m2 and to estimate left heart pressures, mean pulmonary artery pressure (MPAP), and MPWP. The physiological parameters used in the formulae are T˚C, HR (beats per minute [bpm]), and mean CVP (mm Hg); these parameters are used to calculate CI and MAP, which are derived from the charted systolic and diastolic blood pressures (mm Hg), the CVP, and a constant, K. The algorithm incorporates an appropriate constant “K”, derived from the relationship between HR and CVP, which permits estimation of CI in septic or non-septic states [3-5] (Figure 1). Figure 1. The relationship of the number assigned to the constant K with the central venous pressure (CVP; mm Hg) and heart rate (HR). Numbers within the shaded areas are the values of K for these areas. Additionally, we have observed how heart rate variation (HRV), MAP, systolic pressure variation (SPV), pulse pressure variation (PPV) and stroke volume variation (SVV) impact on increasing or decreasing CI. We have observed that, so long as CVP, MAP and core body temperature remain constant, a variable change HRV will increase or decrease the CI value by 0.1 l/min/m2 per beat/min  over a wide range of values. It becomes immediately obvious, therefore, that this is just one of the ways in which the heart regulates and optimizes blood flow, and that the direct and indirect relationships between CVP, MAP, SPV, PPV, SVV, CI and CO impact on the cardiodynamics of flow. The physiological parameters and relationships incorporated into CCDM-HeartSmart® are derived from simple physical principles, laws of hydraulics, and the application of an empirical algorithm (verified using datasets of more than 2700 paired sets of cardiovascular measurements ) that is calculated using the BlandAltman repeatability methods [7-9]. While it was initially thought that there is no direct relationship between the right and left heart pressures and other hemodynamic variables, we have shown that such a relationship does exist . The concept of the K value was first introduced during the early 1900s, with an empirical value of K provided by initial investigations that examined the effects of temperature on the viscosity of fluids, including blood. Changes in temperature also affect resistance; thus, changes in resistance, viscosity and temperature have an indirect relationship with compliance and capacitance of the heart and lungs, all of which contribute to variation in flow, CI (l/min/m2)  and CO (l/min). We retrospectively examined the ICU charts of all patients with SAH admitted between 1999 and 2002, and identified those patients who had PACTD with CI and MPWP measurements. For each patient identified, we compared CO measurements derived from the thermodilution method to those values calculated by CCDMHeartSmart®, using the cardiovascular parameters of HR, MAP, mean CVP and core body temperature. These parameters were all available from the patients’ charts at the time of the calculation. The physiological parameters were entered into CCDM-HeartSmart® algorithm  software on a laptop computer to generate calculated values of CI and PWP (cCI and cPWP, respectively) for comparison with the measured CI (mCI [ml/min/m2]) and the measured PWP (mPWP) or mean pulmonary artery occlusion pressure (mPAOP [mm Hg]). The measurements obtained by the two methods were analyzed by the 95% limits of agreement method, using the adaptation for repeated pairs of observations [8,9]. Calculations were undertaken using Stata 8 (StataCorp LP, College Station, Texas, USA), and the significance of the bias was tested using a paired t-test on the mean bias for each patient. This was a blind study. The measured thermodilution hemodynamic variables were not revealed to the first author until the HeartSmart® calculated values were declared to the medical staff (anesthetist). Over a 4-year period, 101 paired sets of data were retrieved from 21 adult patients admitted to the neurosurgical ICU with SAH and PACTD as part of their treatment. The patients’ conditions were typical of those in neurosurgical intensive care, i.e. mixed diagnoses of traumatic brain injury, tumors and neurovascular disease. In total, 101 sets of readings were obtained (including HR, systolic and diastolic blood pressures [SBP and DBP], MAP, mean CVP, CI, MPWP and BSA). 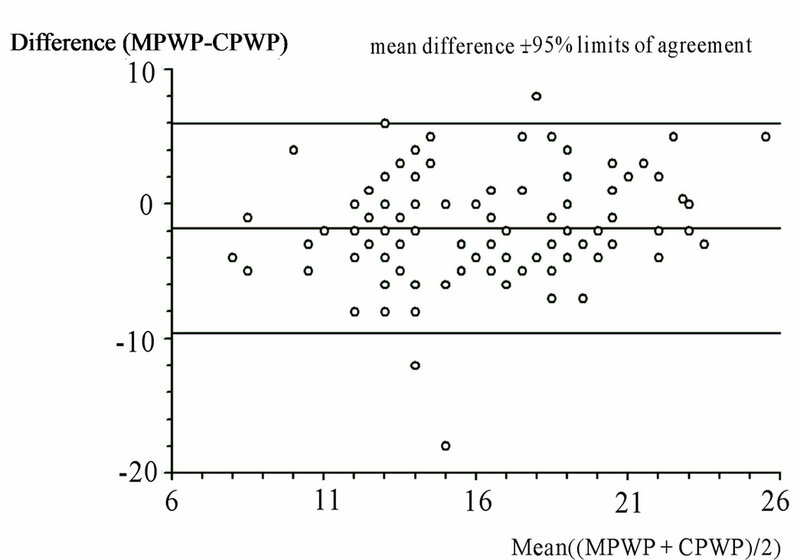 Table 1 compares values of cCI and cPWP calculated using HeartSmart® with mCI and mPWP or (mPAOP) for four sets of questionable data. We have not removed any spurious data from statistical analysis. 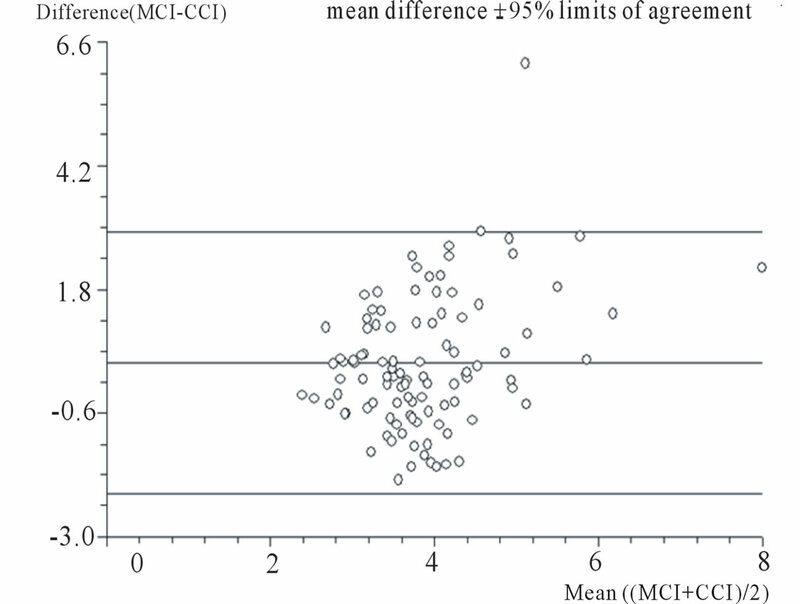 Figure 2 shows the direct and linear relationship between the mCI and the cCI, indicating good correlation between the two methods. The mean of the differences between mCI and cCI was 0.36 l/min/m2 (standard deviation [SD] = 1.30 l/min/m2, standard error [SE] = 0.13 l/min/m2, one-sided p = 0.0001, two-sided p = 0.0001). In the two-sample analysis of agreement, the 95% limits of agreement were –2.18 to 2.91 l/min/m2, an acceptable bias or error of 0.73 l/min/m2 (equivalent to 25.1%) . Table 1. The first nine sets of results (four patients), showing the values for pulmonary artery wedge pressure, cardiac index and cardiac output calculated using HeartSmart® algorithm software compared with the corresponding measured values obtained from the patients’ charts. Figure 2. 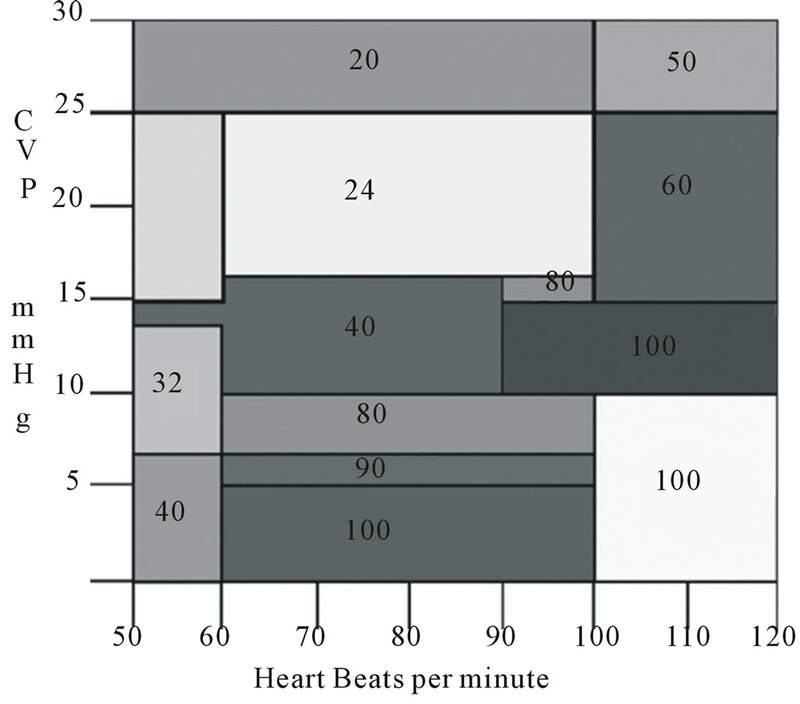 Bland-Altman plot comparing measured cardiac index (mCI; l/min/m2) and calculated cardiac index (cCI; l/min/m2). Paired t test. For differences between mCI and cCI: mean of differences = 0.36 l/min/m2; standard deviation = 1.30 l/min/m2; standard error = 0.13 l/min/m2; one-sided P < 0.0001; two-sided P < 0.0001. Two sample analysis of agreement. 95% limits of agreement = –2.18 l/min/m2 to 2.91 l/min/m2. namic pressures being outside of the normal range, the raised CVP of 20 mm Hg, and the other calculated respiratory or cardiovascular parameters. The abnormally high hyperdynamic mCI in the first set of results for Case 2 (Table 1) is more consistent with a neurological patient in sepsis-shock being over-filled or vasodilated. In this case the core body temperature was slightly above the normal range (37.3˚C). The hemodynamic variables do not support such a high mCI value; interestingly, the difference between the first and second sets of measurements (Table 1) is 1.19 l/min/m2, an acceptable change of 24.54%. The CVP then increases by 3 mm Hg to a mean value of 20 mm Hg, resulting in an increase in mCI to 8.9 l/min/m2 (an increase of 45.51%), versus an increase in cCI to 5.52 l/min/m2 (an increase of 33.7%). The increase in the mPWP from 18 mm Hg to 23 mm Hg (21.74%) and in cPWP from 14 mm Hg to 26.4 mm Hg (47.07%) indicates that someform of interventional treatment has been given in an effort to correct the hypotensive state of MAP, which was approximately 42 mm Hg. If that is the case, then such treatment worsened the hemodynamic status. In a case such as this, the measured systemic vascular resis tance index (mSVRi) = MAP – CVP × 80/mCI or 42 – 17 × 80 = 412 dynessec/cm–5/m2, while the calculated systemic vascular resistance index (cSVRi) = MAP – CV × 80/cCI or 42 – 17 × 80 = 2000/3860 = 518 dynes-sec/cm–5/m2. When the CVP rises to 20 mm Hg, the mSVRi = 42 – 20 × 80 = 1760/mCi = 1760/8900 = 198 dynes-sec/cm–5/m2. For the HeartSmart® values, cSVRi = 42 – 20 × 80 = 1760/cCi = 1760/5520 = 319 dynes-sec/cm–5/m2. The calculated pulmonary vascular resistance index values (cPVRi), calculated by cMPAP – cPWP × 80/cCI (where cMPAP is the calculated MPAP), guide the use of vasopressor drugs, particularly if values are too high or low. We can calculate the MPAP from the expression MAP × 0.2 + CVP or 42 × 0.2 = 8.4 + 17 = 25.4 mm Hg; then 25.4 – 14 = 11.4 × 80 = 912/3660 = 249.2 dynessec/cm–5/m2 . Hence, in Case 2, both sets of hemodynamic measurements reveal a secondary condition of hypotension after the primary insult (MAP, 42 mm Hg). The cause of the hypotension is believed to be a collapse of the peripheral vasomotor system causing global vasodilatation, as seen from the SVRi values, whilst the cPVRi values are cautiously acceptable. If the measured thermodilution values are correct, the sepsis-shock will become irreversible if left uncorrected, likely leading to multiple organ dysfunction and consequential death. Figure 3 shows the Bland-Altman plots of the mPWP and the cPWP. Using the Bland-Altman method for comparison of two measurement techniques, we found good correlation between the results provided by PACTD and HeartSmart®. The mean of the differences between mPWP and cPWP was –1.81 mm Hg (SD = 3.97, SE = 0.39, 95% confidence interval = –2.59 to 1.04 l/min/m2, degrees of freedom (df) = 101, t = –4.63; one-sided p < 0.0001, two-sided p < 0.0001). The outlier in Case 3 (Figure 3) was a 20-year-old female who had been involved in a road traffic accident and who had sustained severe cerebral contusions. We see a difference of 8 mm Hg between the mPWP (8 mm Hg) and the cPWP (16 mm Hg), with a CVP of 10 mm Hg for this patient (Table 1). Examination of her ICU chart helped us to decide which reading was a more likely reflection of the clinical situation. This outlying reading was the second of three readings, the first two of which were within the 95% limits of agreement. This patient had been given fluid resuscitation throughout her admission. At the time of the reading, the following values were recorded: blood pressure, 118/57; MAP, 77 mm Hg, HR, 125 bpm; CVP, 10 mm Hg; temperature, 38.8˚C; mCI, 2.9 l/min/m2; and cCI, 3.95 l/min/m2. Figure 3. Bland-Altman plot comparing the measured pulmonary artery wedge pressure (mPWP; mm Hg) and the calculated pulmonary artery wedge pressure (cPWP; mm Hg) Paired t test. For differences between mPWP (mm Hg) and cPWP (mm Hg): mean of differences = 1.82 mm Hg; standard deviation = 3.97 mm Hg; standard error = 0.39 mm Hg; one-sided P < 0.0001; two-sided P < 0.0001. Two sample analysis of agreement. 95% limits of agreement = –9.60 mm Hg to 5.96 mm Hg. body temperature (38.8˚C), CVP (10 mm Hg) and cPWP (16 mm Hg). Since there is little or no change between the mPWP and mCI values over the three sets of measurements made in Case 3 (Table 1), the mPWP value in the third set of recordings is probably wrong. In Case 1, the third thermodilution measurement of a CVP (8 mm Hg) that is half that of the previous measurement (16 mm Hg) produces a CI value of 2.5 l/min/m2 (Table 1).This value is just on the lower limit of normal, but possibly not high enough in this case to adequately sustain the metabolic requirements of cells with the higher oxygen demand that is being generated by the raised temperature caused by imminent sepsis. The systemic and pulmonary vascular mSVRi = MAP – CVP × 80/mCI or 77 – 8 × 80 = 5600/2500 = 2240 dynessec/cm–5/m2, while the cSVRi = MAP – CVP × 80/CI or 77 – 8 × 80 = 5600/2940 = 1905 dynes-sec/cm–5/m2. The normal range is 1970 - 2390 dynes-sec/cm–5/m2. If we assess the PVR from the expression MAP × 0.2 + CVP or 77 × 0.2 = 15.4 + 8 = 23.4 mm Hg, we can then calculate the cPWP from the expression, cPWP = cMPAP × 0.2 + CVP or 23.4 × 0.2 = 4.68 + 8 = 12.68 mm Hg. Therefore, cPVRi = cMPAP × 0.2 – cPWP × 80/cCI, so 23.4 – 12.68 = 10.72 × 80 = 8576/2940 = 291.7 dynes-sec/cm–5/m2. In this case, the HeartSmart® results of a CI of 2.94 l/min/m2 in conjunction with the left and right heart pressures and remaining hemodynamic variables are more likely to be correct than the PACTD values, showing that this patient (Case 1) responded to treatment, averting sepsis progression. Case 4 showed the following values: CVP, 11 mm Hg; mPWP, 15 mm Hg; cPWP, 16mm Hg; SBP, 76 mm Hg; DBP, 46 mm Hg; MAP, 56 mm Hg; temperature, 37.6˚C; and HR, 100 bpm. The hemodynamic variables are those of a patient developing sepsis–shock with an abnormal CI of 2.16 l/min/m2. This hypodynamic value is not consistent with the hemodynamic variables above, whereas a hyperdynamic flow rate of 5.5 l/min/m2 is more likely to be accurate. Again, the SVRi and PVRi hemodynamic variables were assessed: mSVRi = MAP – CVP × 80/mCI, so 56 – 11 = 44 × 80 = 3520/2190 = 1607.3 dynes-sec/cm–5/m2; cSVRi = MAP – CVP × 80/cCI, so 56 – 11 = 44 × 80 = 3520/5500 = 640.0 dynessec/cm–5/m2. The CVP, mPWP and cPWP are in the upper normal range, indicating a normal to upper CI flow rate (2.5 – 4.5 l/min/m2) with a tachycardic and pyrexial status. These four cases (Table 1), with four of nine paired sets of data (44.44%) regarded as questionable, demonstrate that operator error with PACTD remains a major problem even though the technique has been in existence for over four decades. Table 1 shows the hemodynamic values in each case and it is not difficult to conclude which of the values for CI or MPWP are spurious. Optimal fluid management in neurosurgery is a challenge. Patients often present in a hypovolemic state after head injury associated with multiple trauma and hemorrhagic shock. Neurogenic causes of fluid loss, cerebral salt wasting syndrome (CSWS), and syndrome of inappropriate antidiuretic hormone (SIADH) can occur after trauma, tumors, infarcts and infections. Patients often become confused when fluid intake is poor, and drugs administered to treat raised intracranial pressure (e.g. Mannitol and diuretics) will exacerbate dehydration. As we have shown, erroneous hemodynamic variables-especially in relation to the CI-can lead to treatment errors in the maintenance of fluid homeostasis and resuscitation. However, reliable methods to assess fluid filling are scarce, and those that are available are increasingly moving away from expensive invasive techniques, which have been shown to add little additional value [13,14]. Although there are various methods of hemodynamic monitoring available in the ICU for general neurosurgical patients, the most commonly used is the PACTD technique and even this is needed infrequently, as shown in the current study: only 21 of 1200 (1.75%) patients admitted to the ICU between 1999 and 2002 required PACTD  as part of their routine treatment. Tighter fluid management may have been beneficial in many of those 21 patients and in many more patients who were not monitored due to the invasive nature of PACTD and other established techniques. Had there been a simple method available for hemodynamic monitoring, it is highly likely that routine treatment could have been guided more effectively for many more patients requiring aggressive fluid resuscitation. Furthermore, while junior medical staff and nurses can cope with performing and recording CVP levels, performing a highly invasive procedure such as the PACTD method is a challenge late at night or over the weekend when experienced senior staff are not immediately available. It can be seen from the examples reported that a much simpler, more reliable method of performing hemodynamic monitoring is required. Unfortunately, all too often we rely too much on the various hemodynamic pressures to guide the use of vasopressors and influence which fluid maintenance or resuscitation procedures are given (as seen in Case 1 of the current study). However, it is beneficial to attempt to bring the hemodynamic variables and status back to within normal ranges using less complex methods. The new CCDM HeartSmart® technique offers a highly promising and viable alternative to PACTD and other techniques [15,16] for estimating CI at the bedside. One important advantage of HeartSmart® over other methods is its ability to determine left heart pressures, which is an important factor when using vasopressor drugs in fluid maintenance or resuscitation. In the current study, HeartSmart® provided as good an estimate of CI in neurosurgical patients as the current standard method of PACTD, providing an estimate of MPWP that may be useful in guiding fluid and vasodilator therapy. Importantly, HeartSmart® offers an alternative to PACTD that lacks many of the attendant risks and drawbacks of established, expensive and time-consuming techniques. The unique feature of this new technology is that no special equipment or catheters are necessary because the parameters required for the calculations are all routinely measured during major surgery and in the ICU. Other advantages of CCDM-HeartSmart® are its simplicity, its less invasive nature, and the lack of requirement for additional or specialized line insertion. Currently available thermodilution techniques used to assess cardiac function and filling are limited by their invasive nature, their cost, and their inherent inaccuracy. In contrast, the CCDM-HeartSmart® technique is not so operator-dependent, and the only costs incurred are those needed to purchase and install the software in a relatively cheap monitor. Its versatility means that areas of potential use include the wards, the high-dependency unit and operating theatres, provided that accurate measurement of mean CVP can be ensured. We believe that HeartSmart® could also increase and facilitate the selective use of mild and moderate hypothermia therapy in neurological patients by aiding the identification of those patients who would benefit from this treatment. This study used a well-validated method to compare CCDM-HeartSmart® and PACTD [7-9]: the 95% limits of agreement analysis assesses how closely two methods of measurement of a variable agree, and the means of the differences are an estimate of the average bias of the PACTD method relative to that of the CCDM-HeartSmart® method. The results showed good correlation between the two groups of variables. This small study was limited by its retrospective nature. However, the results correspond to—and are comparable with—the prospective data from larger patient groups, including cardiac surgical patients , septic general ICU patients , and adult and pediatric cardiac catheterization patients in clinical trials that have not yet been published. In the current work and other studies, it has been of particular value to closely examine the frequency of, and variation in, the outlying results in order to examine the robustness of the algorithms in improving fluid maintenance in patient subsets according to the clinical situation (e.g. sepsis-shock, pulmonary artery hypertension) and the effect of treatment(s). Putting things in perspective, it is widely acknowledged that PACTD may have a larger inherent variability and inaccuracy [17-20] than, for example, the Fick method when estimating CI and/or cardiac output values in sepsis-shock and other patients. This is mainly due to the tolerance of the PAC thermistors (caused by increases or decreases in temperature), which affects flow rates. However, because PACTD and other techniques (e.g. the Fick method) are still considered the gold standards for calculating cardiac output, we have used PACTD as a comparator for CCDM-HeartSmart®. The HeartSmart® technology works in real time and is not a predictive technology, as has been suggested . This simple audit illustrates the enormous potential of this new method, CCDM-HeartSmart® , in the assessment of fluid filling and resuscitation in the neurosurgical ICU patient population . This new, simple technology may also help to facilitate routine adoption of perioperative optimization of blood flow using early goal-directed therapy, which offers many other potential benefits (e.g. initiating fluid resuscitation to correct dehydration immediately upon admission) in neurosurgical and medical neurological patients [22-26]. We thank those members of staff who collected the retrospective data used in this study. We would also like to thank Julie Smith for editorial assistance in the preparation of parts of this manuscript. Financial support for this assistance was provided entirely by the first author. Dr. Kenneth J. Warring-Davies is the CEO of HeartSmart™ Limited and Medics Limited. He is also the inventor of the new inverse square rule of the heart and the new empirical physiological formulae in the continuous cardiac dynamic monitoring algorithms financing this work. No other financial inducements were made to any other person or organization. Dr. John Martin Bland declares no conflicts of interest. L. D. Mishra and R. L. Gairola, “Perioperative Fluid Management in Neurosurgical Patients,” Journal of Anaesthesiology Clinical Pharmacology, Vol. 20, No. 2, 2004, pp. 113-119. D. A. McDonald, “Blood Flow in Arteries,” 2nd Edition, Edward Arnold, London, 1960. C. W. Stetz, R. G. Miller, G. E. Kelly and T. A. Raffin, “Reliability of the Thermodilution Method in the Determination of Cardiac Output in Clinical Practice,” American Review of Respiratory Disease, Vol. 126, No. 6, 1982, pp. 1001-1004. T. Mutoh, K. Kazumata, T. Ishikawa and S. Terasaka, “Performance of Bedside Transpulmonary Thermodilution Monitoring for Go l-Directed Hemodynamic Management after Subarachnoid Hemorrhage,” Stroke, Vol. 40, No. 7, 2009, pp. 2368-2374.